Healthians, a home diagnostics service provider, took a B2C route to carve out a niche in diagnostics. As it now expands into South India, can the gambit work? The 36-year-old founder and CEO of Healthians agrees and takes the argument forward with unregulated and unlicenced diagnostic labs as well. “I am waiting for a ‘regulatory moment’ in my segment,” says Sahni, who reckons absence of regulation in diagnostic business in India—a segment where over 80 percent of the players are unorganised—poses danger to people’s health. “Health care, especially diagnostics, is not ecommerce where one can hope for multi-fold growth overnight or in a year,” he says. Started in 2015, Sahni has seen his business grow at a rapid pace. It ended the first year of operations with a paltry revenue of ₹1.1 crore, but the figure leapfrogged to ₹18. 5 crore last fiscal. It is now clocking a run rate of ₹80 crore. Healthians, which has raised over $4 million so far from investors such as Beenext, Digital Garage and Yuvraj Singh-backed YouWeCan Ventures, is operational across 30 cities in North India and recently forayed into Bengaluru, as it attempts to become a pan-India player. The Indian diagnostic market is pegged at $8 billion and is growing at a compounded annual rate of 15 percent. While pathology makes up 80 percent, the rest is occupied by radiology. The massive size of the unorganised market provides a big opportunity to Healthians. Reason: As the credibility of the unorganised sector takes a hit due to the suspect quality of their medical reports, people are moving towards branded players that run their chain of labs. Sahni also shunned the B2B route of growing via franchises. Franchisees, he reckons, might not be loyal as they can dictate terms and change hands. “I gunned for consumer loyalty, and went for a B2C (business to consumer) approach to build business,” he says, adding that the move hampered his efforts in raising money initially. “I was rejected by 12 investors because I was trying to build up a business which was not doctor led,” he says. 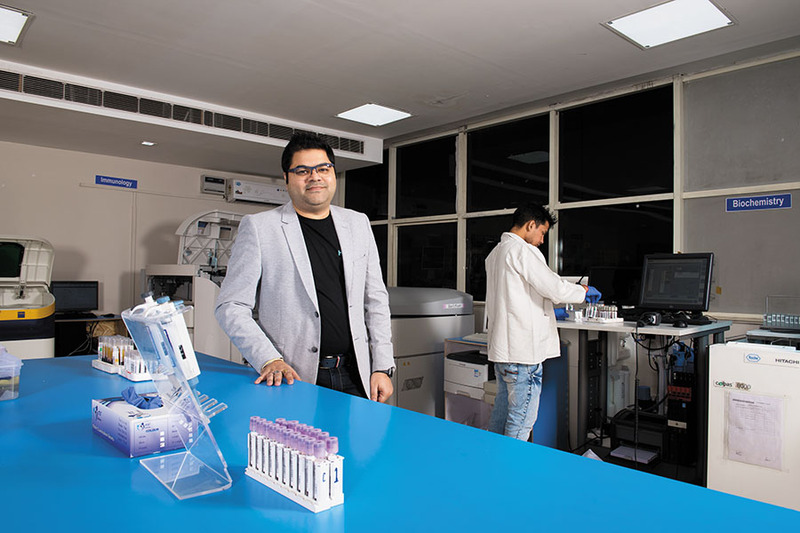 His business had another unique feature: Low operational cost as the asset-light model revolves around taking up standalone pathology labs with high-quality equipment and running it with lab technicians and staff hired by Healthians. Ample care was taken to position the brand as ‘different’ by offering an array of free services such as home sample collection, doctor and diet consultation, blood pressure and sugar check for family members. The move has paid off. The startup, which collects around 3,000 samples every day, has completed 10 million tests so far. Opting for the ‘Red Ocean’ strategy (competing head-on with the market leader as well as a host of rivals) also turned out to be a bold and successful experiment. The National Capital Region (NCR), which happens to be the most competitive diagnostic market in India, was selected as the place to start operations. The idea was simple: Cracking this market would make the startup battle-ready to expand elsewhere. “Now 90 percent of our revenue comes from the region,” says Sahni. Experts reckon that an increasing trend of people opting for preventive tests and the ease of home collection of samples offered by Healthians helped it gain acceptance. “Online players like Healthians are able to tap into these trends and serve a loyal segment that wants to get quality testing for preventive purposes at an affordable price,” says Anil Kumar, CEO of RedSeer Consulting. The growth was also aided by other factors. An HDFC Bank Investment Advisory Group report on health care delivery points out that over 70 percent of medical decisions are now based on diagnostic results. Rising literacy level and per capita income, coupled with expected improvement in health care services, are likely to bring volume growth for the industry from such areas, the report adds. A jump in lifestyle-related diseases has also led to an increase in demand for diagnostic services. “We focussed on preventive health care and have been sensitising people about getting tests done regularly,” says Sahni. There have been several challenges along the way. The biggest was the multiple pivots Healthians has had since its inception. It started as an aggregator of diagnostic labs. But within a few months, the startup changed from an aggregation to a logistics model. The problem with the aggregation model, recalls Sahni, was that while Healthians was generating business for the labs, the collection of samples was under the control of labs. “Many a times, the collection guy would not reach as per schedule or charge money for collecting samples,” he says. This hurt the credibility of the brand as the business was generated by Healthians. The second pivot happened in quick succession. Though the samples were now collected on time, there was no control over the quality of tests. The next move was to bring labs under control and run the entire operations. Earlier, Healthians used to have quality supervisors at the labs. Now, pathologists were hired, and entire operations were run by the startup. The focus shifted to spreading the message of ‘accuracy’ of tests and consumers were offered a chance to visit the lab. With operations stabilising in North India, Healthians is now looking to go deeper into the South. It plans to invest ₹50 crore to expand across Bengaluru, Hyderabad and Chennai, and add over 200 labs and 3,000 phlebotomists across 30 cities over 18 months. In spite of the growth, the challenge still remains: In smaller cities, unorganised players account for over 80 percent of the diagnostic market. Competing against them would be a time-consuming process. Another challenge would be to spend marketing dollars on building brand and creating awareness, which, in turn, might spike the operational expenses. Sahni is quick to point out that things are changing as the brand gains acceptance even from doctors. “Now we get 10-15 percent of revenue from referrals made by them. And this is without any commission,” he adds. Kumar of RedSeer Consulting points out another issue. The current online penetration of diagnostioc tests is a little under 1 percent, as a large number of doctors and nursing homes collect samples in-house or refer a particular lab. “So the patients don’t get a chance to explore options,” he says.